Cloud forests are the misty forests found high on tropical mountains. Frequently cloud-enshrouded, many are reminiscent of fairy-tale forests, having twisted, stunted old trees covered in moss and ferns. But their importance is real. Their trees, and the plants and lichens living on them, intercept water vapor that can supply 75% of the stream water in drier places. And they are among the most biodiverse ecosystems on Earth. Thousands of unique species evolved where fog and mist have created strikingly wetter habitat isolated on mountains. The effects are near. In Mexico, Central America and the Caribbean, warming would reduce cloud immersion in 100% of cloud forests. Monarch butterflies spend their winters, by the millions, in cloud forests of Central Mexico and in the forests just below them, where they depend on clouds to stabilize temperatures. 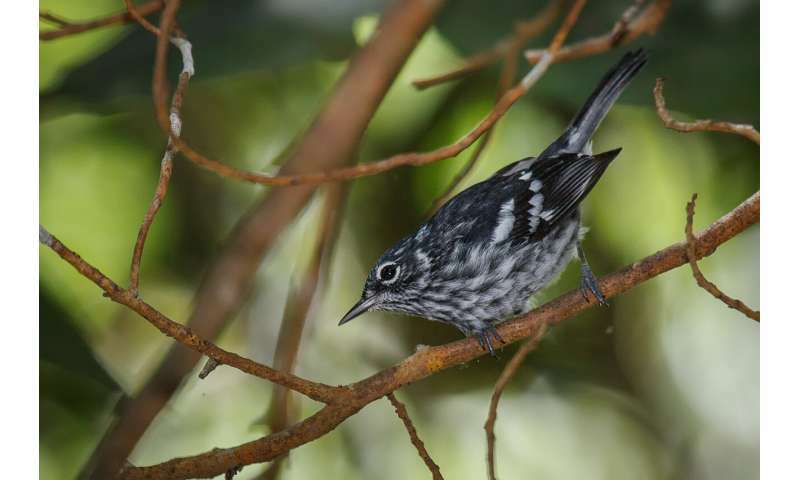 In the Caribbean, the U.S. National Forest El Yunque harbors the threatened Elfin Woods Warbler, found only in Puerto Rico's mountains. It is named after the mossy, mysterious "elfin" cloud forests on mountaintops. In Central America, tourists from around the world visit the Monteverde Cloud Forest Reserve in Costa Rica. While traversing treetop walkways there, they can feel the strength of trade winds forcing humid air up mountains and hear the ethereal songs of Nightingale Thrushes. All of these cloud forests will be affected from fewer or thinner clouds that form at higher elevations, and from drier conditions. The Federally Threatened Elfin Woods Warbler occurs only in Puerto Rico's mountains. Cloud forests dominate its range. Credit: Gloria Archilla. This study is the first to quantify these potential changes across continents. To do so, scientists from U.S. Forest Service labs in Puerto Rico and Fort Collins, Colorado, and from Colorado State University developed a new approach. They mapped and projected how climate change would affect the feature that cloud forest species are uniquely adapted to: cloud immersion. The team mapped current cloud forest areas across the Western Hemisphere with data on climate and mountain size and observations from dozens of ecological studies, including historical ones dating back 50 to 60 years. They then projected cloud forest extent and relative humidity, a proxy for cloud frequency and density, with scenarios for future greenhouse gas emissions and associated climate conditions. 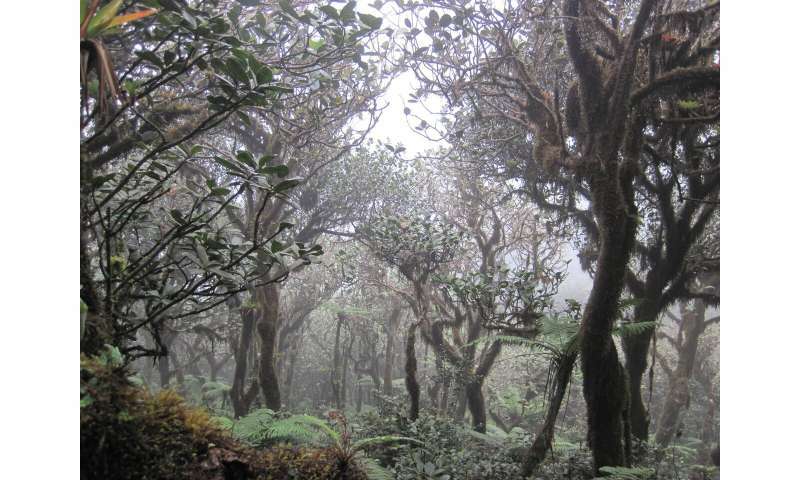 Before this research, studies from a handful of sites suggested that cloud immersion would increase in some cloud forests but decline in others. Cloud immersion might increase because air humidity will increase over warming oceans, implying thicker clouds forming at lower elevations and cloudier forests. Cloud immersion might decrease because increased temperatures over land could force air to travel further up mountains before it cools enough to form clouds, reducing cloud forest area and cloudiness. The fates of the rest of cloud forests were unknown. Global climate modeling is too coarse to target effects on cloud forests. This new study found that cloud immersion would increase for only about 1% of all Western Hemisphere cloud forests, in only a few regions of South America. Declines in cloud immersion would dominate. Did they analyze where new cloud forest would form in different locations around the globe?